PIN Delivery System (sell PINs) is a web based system designed to sell intangible products such as phone card PINs, serial numbers or license numbers for software items, access codes to applications, access URLs to special areas of websites, and in general, any type of code that you would like to sell online. Dreamweaver MX or any later version (Dreamweaver MX, MX 2004, DW 8, CS3, CS4, CS5, CS6, CC,...). Please check this video about the use of the product. You can find more details about the system and configuration in the "Notes" section below. You can find more about in our PIN Delivery System - Sell PINs - FAQ. #1 - Into the downloaded file you will find a .MXP file. To install it, you simply need to double click that file, or use the Adobe Extension Manager tool. #2 - In your MySQL, create a database with any desired name. If you already have a database, you may use it. Host: The name of the server where your MySQL database is hosted (localhost in most cases). Database: The name of your MySQL database. Username: The user name to access the database. Password: The password to access your MySQL database. Admin password: The password to access the Admin Panel. Email: The email address of the PayPal account where you wish to receive payments. 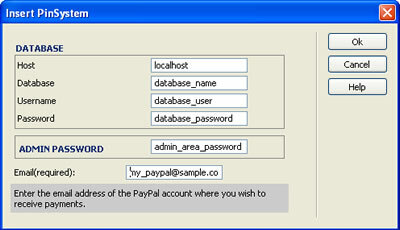 #4 - Log into Admin Panel using the password that you specified in the previous step, and enter at least one PIN category and codes for sale corresponding to that category. The Admin Panel is loaded by calling from your browser the address where the System had been copied to, for example: http://www.your-web-site/psadmin in case you copied the System at the root of your website. Our Technical Support Team will assist you with any issue or question that you may have regarding the installation and use. Some PayPal configurations may affect the system of automatic notifications, therefore, if you experience any problems do not hesitate to contact us.